Ghee. Bring butter to a boil until the milk solids separate, discard the milk solids, and what is left is called ghee. Making it at home doesn’t take time, in fact, it is so much fun since you can add different flavors to it. In India, it is made plain, but sometimes spices are added to enhance the flavor of the dish, some add curry leaves, others add cumin seeds. You can add the spices after discarding the milk solids. I don’t add spices to my ghee; I like it plain and simple. 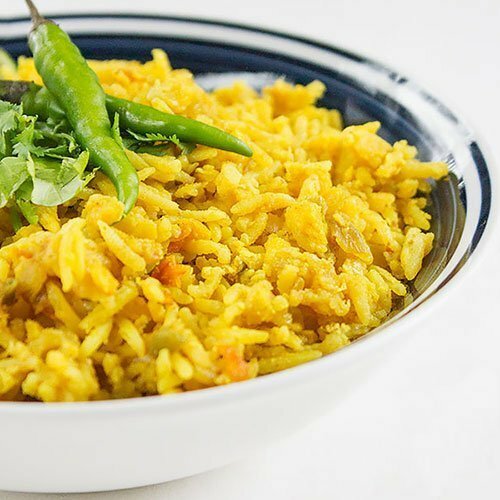 Adding different flavors is excellent, but then your options are limited when using it, for example, you can’t add curry flavored ghee to a sweet dish! Of course, you can make both, but from my experience, the flavored one doesn’t hold the flavor for a long time, in fact, the taste changes a little. 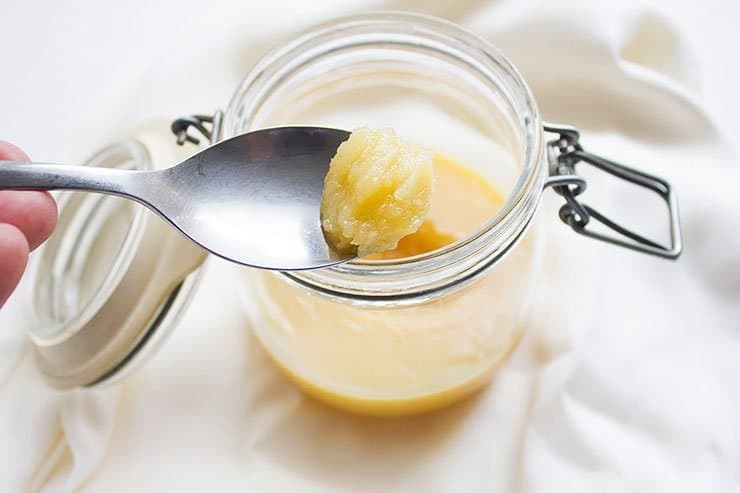 Ghee tastes better than butter and doesn’t burn like butter. You can use it the same way you use oil. 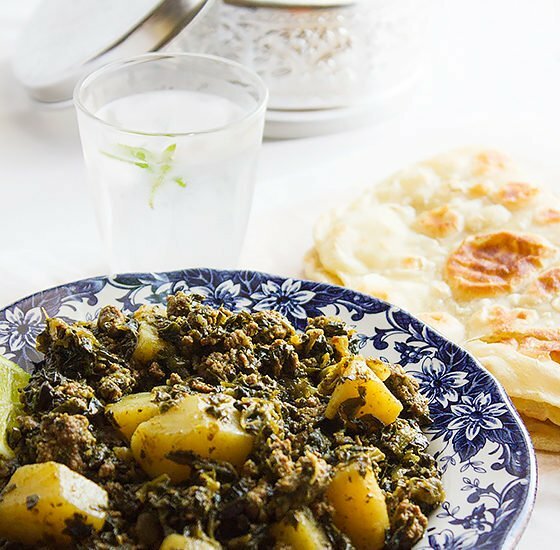 Dishes made with ghee have heavenly flavor and aroma. I keep my ghee in the fridge in the summer. 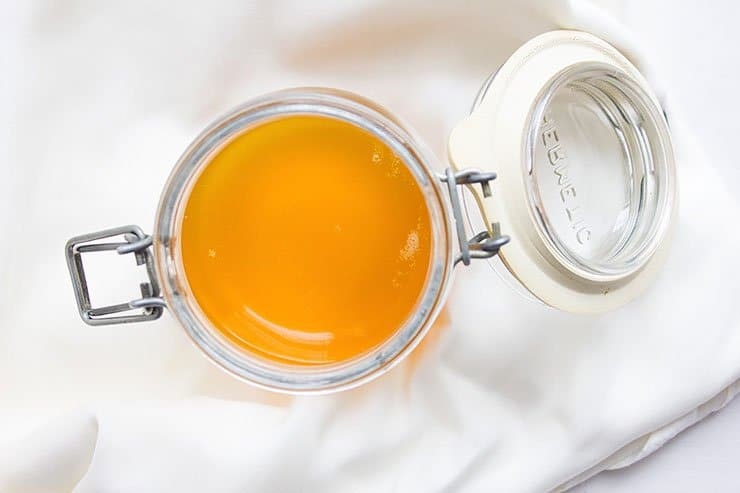 Ghee can be light in color and can be a little dark. When using homemade butter, the color will be much lighter. 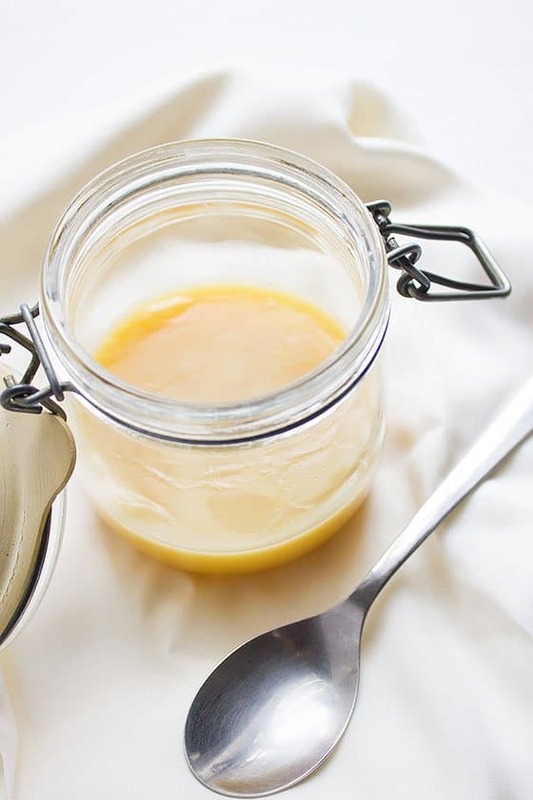 Using store-bought butter to make ghee will result in dark golden color, and that’s due to the ingredients used while processing the butter in the factories. In this recipe, I have used store-bought butter. 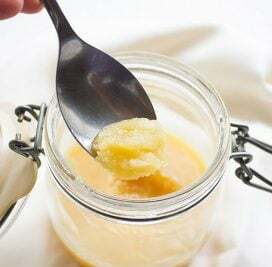 Hint: When making ghee, keep the flame between medium and medium-low to prevent the milk solids from burning and destroying the taste of the ghee. 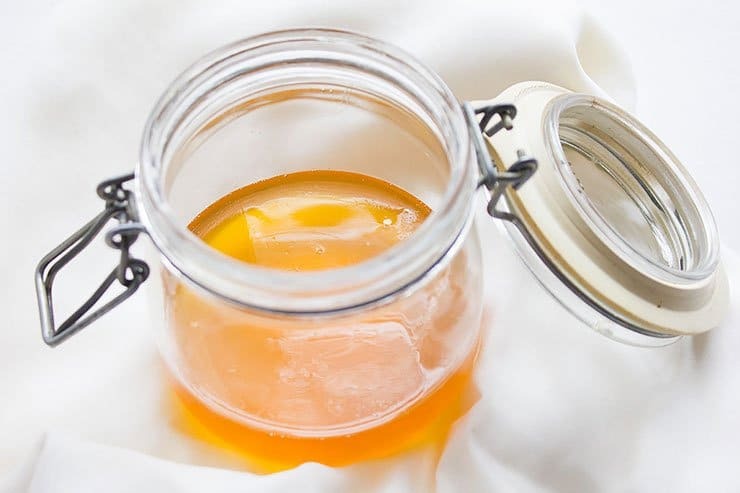 Hint: Make sure to use a clean glass or plastic container that are airtight to keep the ghee tasting fresh. Clarified butter made from scratch. You can use it the same way you use oil but it will add amazing flavor to your cooking. Perfect for savory and sweet dishes. In a saucepan, add the butter and let it melt completely. Let it come to a boil and then reduce the heat. A foam will form and will disappear, occasionally stir the butter to prevent milk solids from sinking to the bottom and burn. 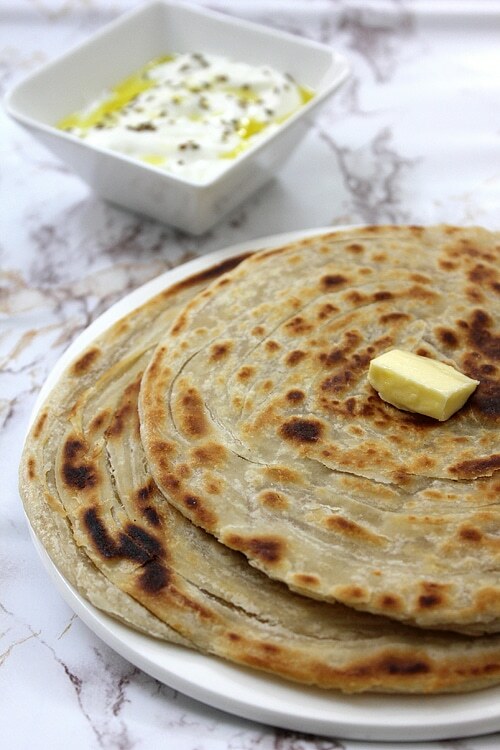 When the butter boils again, turns into a golden color, and the milk solids are now brown in color and at the bottom of the pan, then your ghee is ready so turn off the heat. Pour the ghee through a mesh strainer to a heatproof container with airtight lid (I prefer glass). Be careful since the ghee will be really hot at this point. 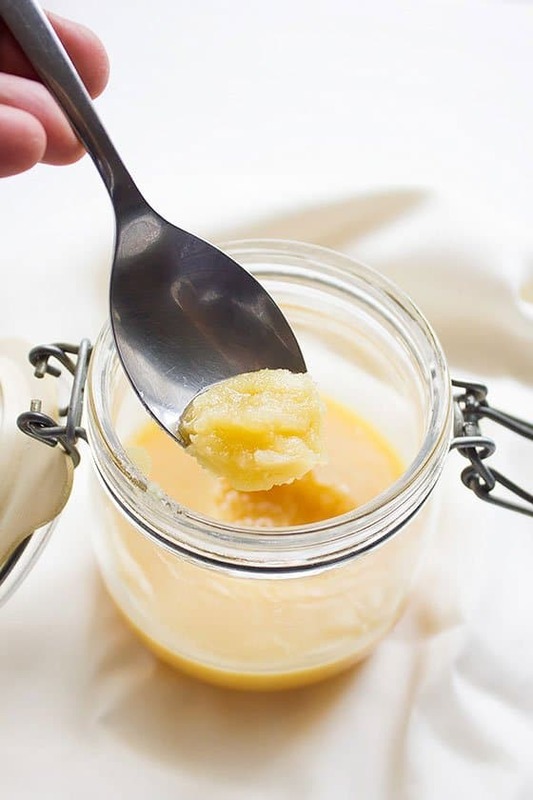 The ghee can be left at room temperature in a dark place for up to a month, but if refrigerated it can stay up to a year.